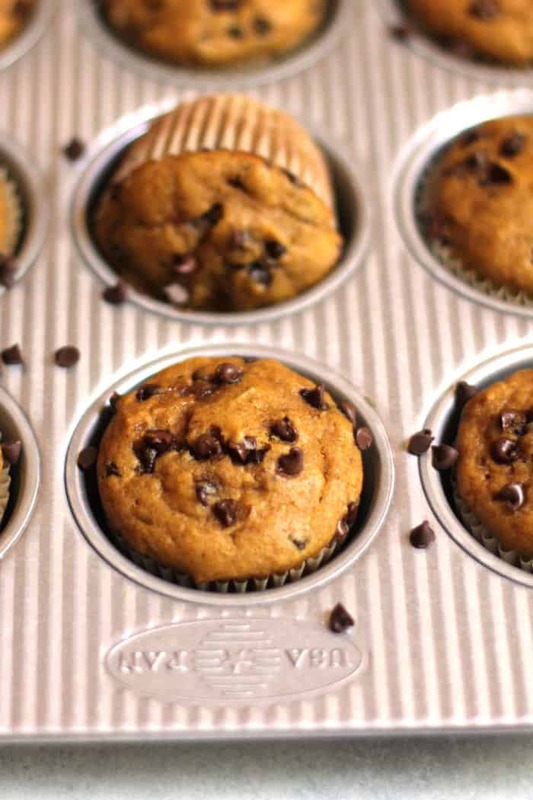 Pumpkin Chocolate Chip Muffins spell fall, and that means cooler weather is coming. These fall treats are full of pumpkin, cinnamon, pumpkin pie spice (and everything nice), and lots of mini chocolate chips. A great combo that gets me so so excited! Thinking about all the reasons why you should make these pumpkin muffins this week. Keep in mind that our kitchen remodel just started, and so YOU should make them because I cannot. 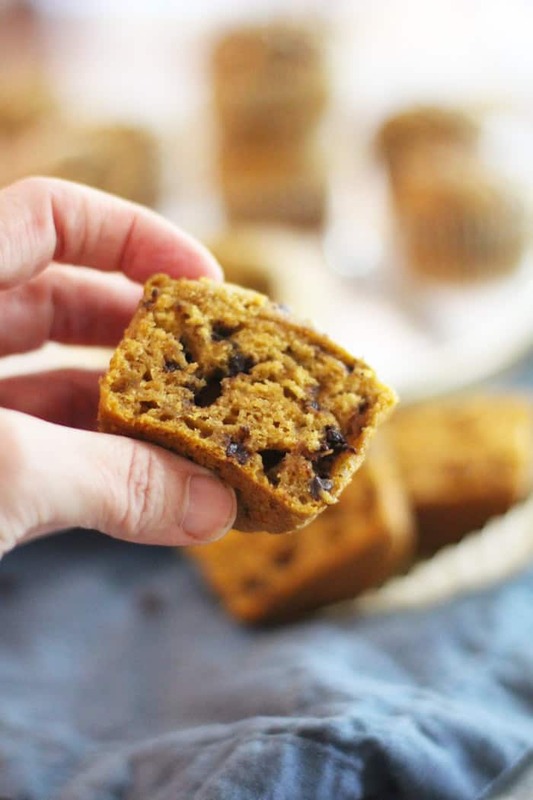 Let’s talk about the positives of pumpkin muffins. chocolate fix because why not? Ok, bring me some please? Friends, if you are like me, and you need more pumpkin in your life, please go type “pumpkin” in my search bar. You’ll be happy you did, and you will have pumpkin ideas galore. Use two bowls, one with wet ingredients and one with dry ingredients. Stir the dry into the wet very gently, to avoid over-working the dough. Reserve about 2 tablespoons of mini chocolate chips for the top of the muffins. Watch them close at the end to avoid over-baking. Test the muffins with a toothpick, and when it comes out clean, they’re done. Storage tip – store muffins on the counter in ziplock or airtight container, for up to three days. Freezing tip – freeze muffins in airtight container, with freezer bag over top (for best results), for up to three months. 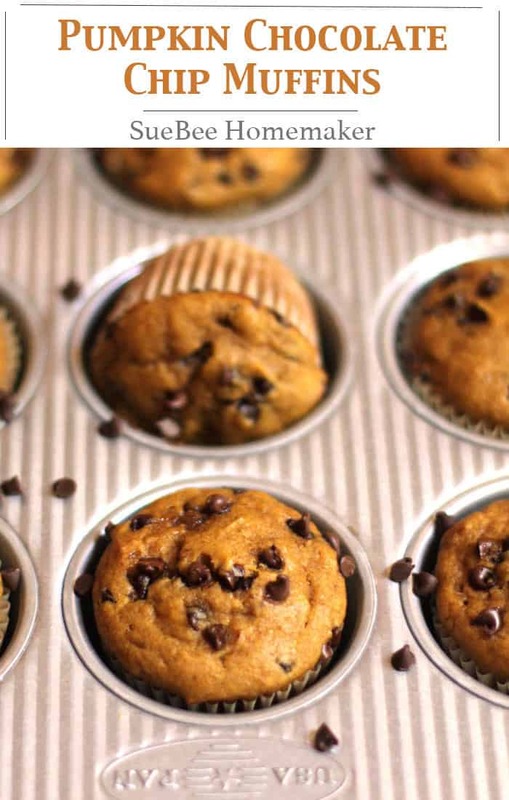 Pumpkin Chocolate Chip Muffins spell fall, and that means cooler weather is coming. These fall treats are full of pumpkin, cinnamon, pumpkin pie spice (and everything nice), and lots of mini chocolate chips. Preheat oven to 350 degrees. Prepare muffin tin with parchment paper muffin liners. In a large mixing bowl, combine the wet ingredients - the pumpkin, canola oil, applesauce, sour cream, honey, eggs, and vanilla. In another bowl, combine the dry ingredients - the flour, brown sugar, baking soda, salt, cinnamon, and pumpkin pie spice. Dump the dry ingredients into the wet, and stir until just combined. Add mini chocolate chips (reserving 2 tablespoons), and stir again. Add the remaining chocolate chips to the top of the muffins. Bake for 18-20 minutes, or until the center is done. You can test with a toothpick. 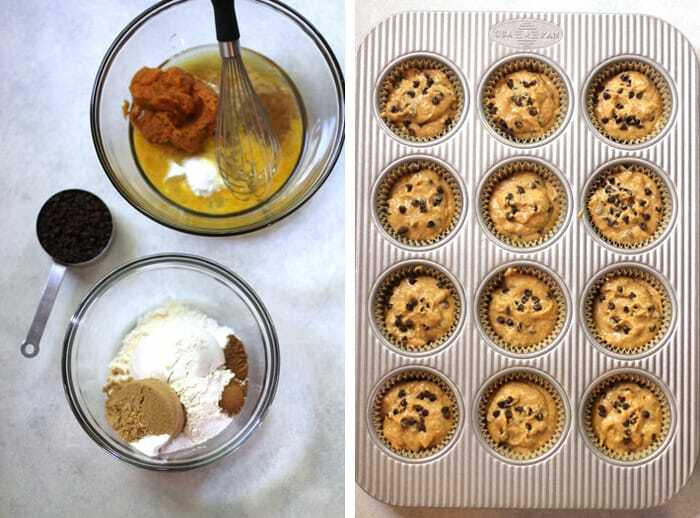 Remove muffins to a cooling rack. You should have enough batter to make about six more muffins. Stir the dry ingredients into the wet very slowly to avoid over-working the dough. Reserve some chocolate chips for the top of the muffins. Test the muffins with a toothpick, and when it comes out clean, they're done. 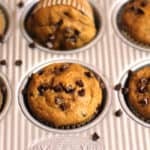 Storage tip - store muffins on the counter in ziplock or airtight container, for up to three days. Freezing tip - freeze muffins in airtight container, with freezer bag over top (for best results), for up to three months. Pumpkin and chocolate?!! I’m in!! These were simple to make, no mixer necessary and super delish!! I made these in my mini muffin pan last week for the kids lunches! I blinked and they were gone! Yum! Yay! Double the recipe next time, Cathy! 🙂 Thanks for your sweet note. 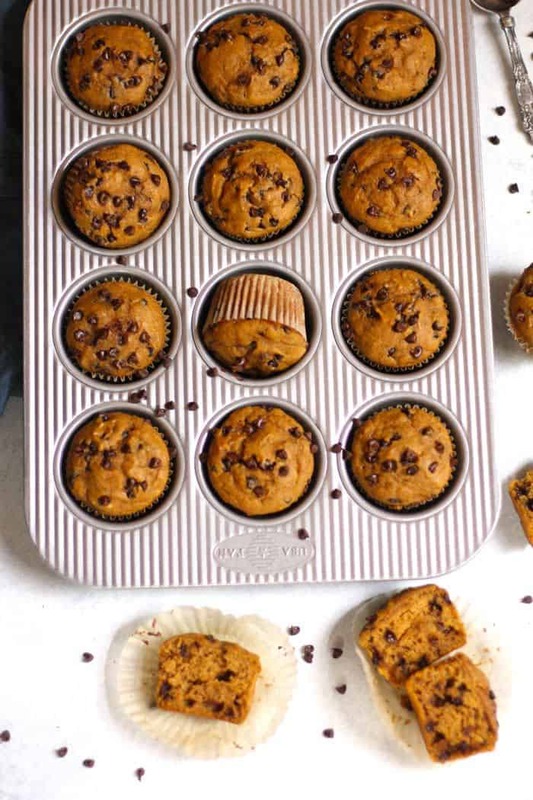 These muffins look so delicious and perfect for weekend brunch! Score! Give me quality over quantity. This is a steal for under 200 calories. When will the kitchen be done again? I am ready!